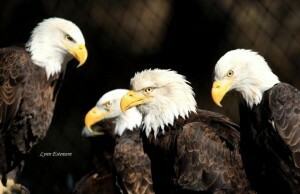 “Primo”, “Sec”, “Trip” and “Quadra” are four Bald Eagles who have been non-releasable Animal Ambassadors for 15 years or more. They were being cared for by a rehabilitator in Sprague River, OR until 2010 when she lost a battle with cancer, and the Eagles came to Badger Run. “Primo” is a male who is currently about 35 years old. He came to rehab when he was about 10, with a broken wing after being hit by a car. He recuperated well, and soon flew away from his open topped exercise pen. Then he got hungry one day, and flew back in for lunch, then left. This pattern continued for a few years, until he decided not to leave anymore, and has been a resident Ambassador ever since. “Sec”, “Trip” and “Quadra” are all partial wing amputees and are non-flighted. We’re not sure if “Sec” was hit by car, but we know that “Trip” and “Quadra” had their wings blown off by shotgun blasts. And sadly, no, the perpetrators were never caught. Note: We lost Trip in October 2015 & Primo in January 2017 due to complications from advanced age. Thank you for being there when these gorgeous birds needed you, and any other wildlife/animals. All rehab workers, volunteers and anyone else who have part please pat your selves on the back for the awesome work you do.